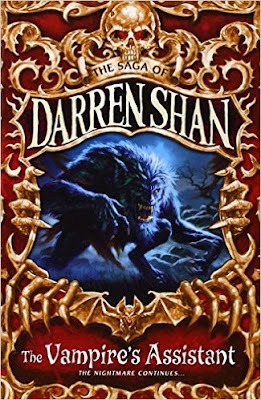 Synopsis: Darren Shan was just an ordinary schoolboy until his visit to the Cirque Du Freak. Now, as he struggles with his new life as a vampire's assistant, he tries desperately to resist the one temptation that sickens him, the one thing that can keep him alive. But destiny is calling ... the wolfman is waiting. Review: This is the second book in the Cirque Du Freak series. I bought all twelve of the books in the Cirque Du Freak series at a local second hand shop. These books cost 99p and come on a buy one get one free offer. After reading the first book I just knew I had to read the full set one after the other. Although I did not enjoy this book as much as I did the first, it was still a very good read. This was an interesting read and it is an important part of the series. So far I am enjoying this book series and I am glad that I was able to get my hands on the full book series. I would recommend this book series (in my opinion it's important to finish a book series if you start it) to anyone with an interest in the young adult and paranormal fiction genres. So far these two books have been good reads and I am sure that the rest will be too.